At the foot of the Jbel Toubkal (4167m) in one of the most beautiful valleys of the High Atlas, this excursion to the Imlil Valley takes place, a unique opportunity to enjoy nature. 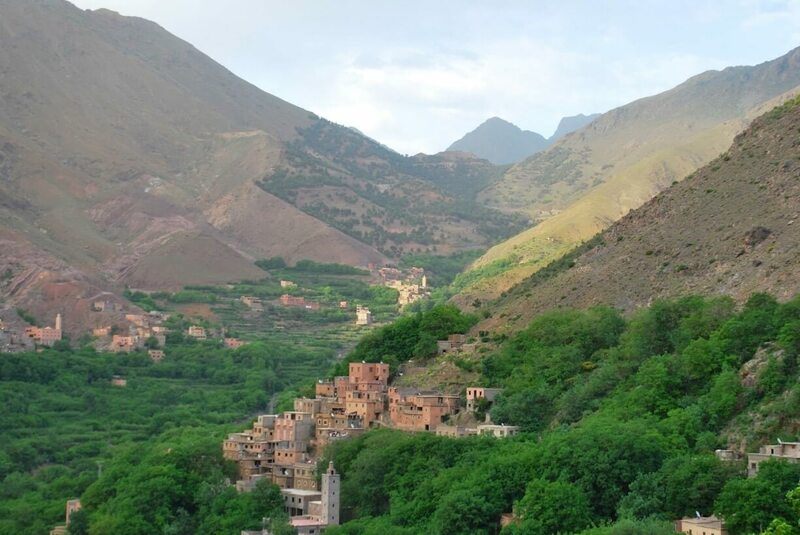 The landscape with spectacular gorges in Moulay Brahim or villages with traditional markets, will be the views that will accompany you on this fantastic excursion. Departure from your Riad / Hotel in Marrakech at 8:00 am to Imlil. We will cross Tahnaout and head south to the Moulay Brahim Gorges, and to Asni, where you can enjoy a weekly Berber market. Then we will go to Imlil (1,740m), located in the mountains of the Western Atlas. We arrive at Imlil, where we will leave our vehicle, and we will meet with your local guide before leaving for about 4 km of excursion towards the south, to the Berber village of (Aremd) (1,843m), passing through the hamlets of souka ait, Targa , and Imoula, and before us we will have Jbels Aguelzim (3,547m), Aksouâl (3,847m) and Adrar Adj (3,122m) watching us all the way. We will continue to Aremd where we will stop to visit this singular place, a village in the valley of Aït Mizane Assif, with views of the old fields of barley, corn, irrigated terraced vegetables and always surrounded by almond and walnut trees. All these particularities make this landscape and this place an ideal place to spend a rural day very close to Marrakech, ideal for nature lovers. The walk continues another half hour until the stop for lunch that will be served between a Berber family in the village of Achayn. After lunch we will return to the other side of the valley again to Imlil to Marrakech.